Happy Hanukkah! In 2017, the holiday begins on Dec. 12 in 2017. 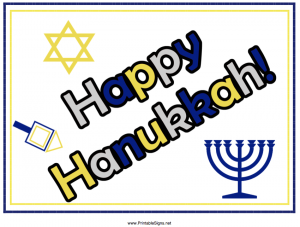 My FreePrintable.net websites have dozens of Hanukkah printables, from gift tags and page borders to certificates and banners. At FreePrintableGiftTags.net, there’s a broad selection of full-color Hanukkah gift tags illustrated with presents, dreidels, Stars of David, and menorahs. Stick one on a present (with tape or print on sticker paper). Or, add a tag to a gift of food. You’ll find a Hanukkah grocery list and other shopping lists and menu planners at FreePrintableGroceryList.com. A Hanukkah recipe card with dreidels can be found at FreePrintableRecipeCards.net. There are more than a dozen Hanukkah coloring pages at BibleColoringPages.org. Kids can color a traditional menorah lighting, a celebratory meal, or illustrations of children. PrintableJewishCalendar.com has Jewish calendars that cover the year 2017 and Hebrew year 5777. There are versions with Hebrew dates and Gregorian equivalents, Jewish holidays noted, and other configurations. They’re all free, and would make a nice gift. Try printing onto cardstock, laminating a calendar, or rolling up a year’s worth of pages and tying them up with a ribbon. PrintableBanners.net has a blue Hanukkah banner that says “Happy Hanukkah,” Hanukkah signs can be found at PrintableSigns.net, and PageBorders.net has a colorful Hanukkah border. For all your Hanukkah faxing needs, head to FreeFaxCoverSheets.net for Hanukkah fax cover sheets. 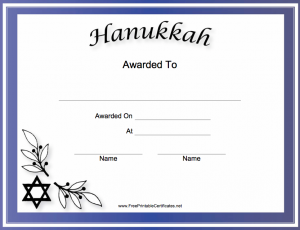 There are Hanukkah certificates at FreePrintableCertificates.net, including versions with “Chanukah” spelling. There’s a free version of every printable. In some cases, such as recipe cards and certificates, a PDF version is free while a customizable DOC (Microsoft Word) version costs a few dollars.